Interestingly, Australia is considered a western nation because of culture, language, and high standard of living - despite being in the far east. Re: Australia a western nation? Yes, I think so. Just as New Zealand. I think "western" stems from the Cold War where the 'West' (US, NATO and friends) faced off against the 'East' (USSR, China, and friends). So not really based in geography. Australia is in the Far East?! Or the Far West, depending on your POV. I disagree. I suspect term Western or Eastern civilization refer more to cultural mores that permeate that particular society, and predates the Cold War. Australia was ‘discovered’ by Europeans and that culture took root there. Just as Europeans ‘discovered’ the Americas and brought their culture here. After hours and hours of hard graft with some colored crayons, a sharp pencil, some tracing paper, and my very worn copy The ACME Junior Geography Atlas™, I produced this pretty graphic for y'all. Imagine my total surprise when I then discovered somebody at Wikipedia had already drawn exactly the same map as me! If only I had known that. p.s. The term "Far East" is an outdated euro-centric device; since the 1960s, East Asia has become the most common term for the region in international mass media outlets. In 1939 Robert Menzies, Prime Minister of Australia reflected on his country's geopolitical concerns with the onset of war. Australia is about as "Western" as you can get IMO. I've lived in Perth (on the Western side of this great nation) and get pretty opinionated on this. The Australians have a Parliamentary system of government - a gift from being a part of the United Kingdom. Also a few prisoners, a gift from Britain back when. Australians might go their own way in some matters, but that's common in most Wester countries. I lived in Perth for 8 years - the Western part of this Western nation and have to admit that the Aussie way of life is pretty fantastic. If we're going to get technical, the UN lumps Australia and New Zealand with the US, Canada and Israel as "Western Europe and Others", which groups what were the capitalist European economies during the Cold War (that means Turkey and Greece are also in this group). They weren't communist (Eastern Europe group), the don't belong in the region they are (US/Canada set aside from Latin America and Caribbean group; Turkey, Australia and New Zealand from the Asia-Pacific group; Greece from the Eastern Europe group; and Israel due to Arab opposition in both the Africa and Asia-Pacific group), and they were militarily aligned after WWII. But yes, due to this alignment, the Aussies and Kiwis are considered Westerners. I look at Australia as a Democratic Nation with similar values as ours and who has always been a friend and a US supporter in peace and war. May it always be so. Location means nothing. For better or worse in some of those wars. But yes, firmly "western", but we also cearly understand that Oceania is more part of east Asia than anwhere else geographically, even if some politicians prefernce historic ties to Britain.. As a result, our diplomatic stance on Asian issues can be more nuanced than some other nations. Aye, neither geographically nor culturally. I seem to remember a bit of a brouhaha being caused not too long ago when a US politician publicly compared Australia to Alabama. The Australian Prime Minister was not amused in the slightest, but I can only assume that he had never actually visited Alabama. If he had, he'd have known that though the accents might be different, between Bogans and Rednecks the hearts and the mullets are very much the same. Similar to the original thread topic, people from outside the US are dismayed to find that what we refer to as "The Midwest" is actually North and most of it is East of the nation's midpoint, the Mississippi River. In French we still call Near East what in English you call Middle East, I don't know in the middle of what it's supposed to be. Australia is a bit West of my location. It'd be about 40 years behind us socially though. When I hear the term the Far East, it reminds me of TFE Hotels! When discussing time zones and geographically, I am in the Far East - same as Japan. Australia is a Western Nation, that happens to be located in the Far East. We are in the Asia-Pacific Region though, for reasons not just in terms of geography. Australia has historically been a European nation (primarily of Anglo Celtic heritage) but this is now changing. Increased non-Caucasian migration since the White Australia Policy was ended in the 70's has changed the racial makeup of the nation. Sydney and Melbourne are now at 25-30% of residents who have Asian ancestry, with the other large cities not far behind. In 2016 there were almost 160'000 permanent migrants from Asia and the Middle East, compared to only 30'000 from Europe. China and India have replaced the UK and New Zealand as the two biggest nations of origin for migrants. Australia's cultural, business and political leaders are still overwhelmingly white however. The nation as never had a non Anglo Celtic Prime Minister, let alone a non European one, and very few politicians who are not white. Turn on a TV and it's again it's almost overwhelmingly white faces. Will Australia become a majority Asian nation? Hard to predict, but not for at least one generation. China has only become the number one source of migrants to Australia in the last 10 years, but the trends are pretty solid. Asian Australians are also making up a bigger share of the younger, the university educated, the upper and middle classes, which will only add to their ascendance in the demographics of the country. There will be some resistance from Caucasians, but that is mostly concentrated in older and poorer people in rural and regional areas with low population growth. Politically these people have had a flirtation with far right anti-immigrant political parties, but they are increasingly becoming electorally unviable. For instance there was a state election in Victoria late last year, despite the right wing party running a fear campaign based on "migrant criminals" and the "threats" of increased immigration the now more diverse middle class voters abandoned them and switched their support to the centre left party which supports migration. My prediction is Australia will move towards a "Eurasian" nation rather than a solely Anglo Celtic or Asian one. Every year I see more evidence of Asian culture fusing in here, to match the changing demographics of the nation. I would describe them as "Western", but due to cultural reasons, not geographical. It's a bit similar to "Scandinavia". Denmark is really only culturally Scandinavian, being more geographically connected to continental Europe (and historically extended into Germany). Finland OTOH is mostly omitted for cultural differences. But ultimately it's just a meaningless description. I've been to "eastern" countries that felt more "western" than parts of the "west", and vice versa. I like the term "Westernized Asia" or "Westernized Pacific" : Australia, New Zealand, New Caledonia, Hong Kong, Japan, Singapore, Guam and Tahiti. They're a bunch of savages mate....They consider VB to be a beer and AFL to be a sport. Last edited by zkojq on Sat Feb 09, 2019 3:12 pm, edited 1 time in total. I wish I had a definitive answer. In terms of religion; 95.6% identify themselves as Christian - not a feature you typically find in other East Asian countries. The indigenous culture is a long way from "Western" norms, but then the same can be said for the First Nations in Canada, Aboriginies in Australia, Native Americans, Saami, etc, etc. Arguably Greenland is in a similar position. I could just as easily see both excluded. Perhaps Samuel P Huntington is the best person to ask. The only weird thing is when people living in the Middle East are called "Asians". Don’t lump us in with Australia, they can’t keep a Prime Minister in office, they’re a failing state IMO. Well, they are Asians. It's just that Asia is a massive continent in which a large spectrum of ethnic groups and cultures exist and we tend to refer to more specific regions within Asia when speaking of an area of group of people. I always found it odd how Europe is the only "continent" that is purely defined by ethnic and cultural boundaries, while the rest of the continents are defined by large tectonic plates and the smaller plates smushed into them. By that definition, Europe is a part of Asia too. True. We're all crisis actors trying to convince you the earth isn't flat. Former colony or protectorate of a "western" nation I assume. All the other pacific islands are blue also. VB is better than that pommy beer Fosters, which is why people switched. My fellow Austraians disgust me with Carlton Draught, Corona and XXXX (truly digustig mid-strength) being the 3 top selling beers. At least Fosters has been pretty much driven from the continent! Wait a minute...Tasmania is better referred to as, the Lesser Western Island. I always found it odd how Europe (or if you prefer, Asia) is the only "continent" that is purely defined by ethnic and cultural boundaries, while the rest of the continents are defined by large tectonic plates and the smaller plates smushed into them. By that definition, Europe (and Asia) is are part of ….. I am all too familiar with the curse of Euro-centric viewpoints, so perhaps you will forgive me for smiling at your Asia-centric language in this case..
Or did you really mean to suggest that Europe was solely to blame and should therefore cease to exist? There are still issues because whilst in geological terms Eurasia is often considered as a single rigid megablock, the rigidity of Eurasia has been questioned based on paleomagnetic data. You might also like to consider that if you are hanging your definition on tectonic plates, then India belongs with Australia. However, since the commonly accepted definition in that case depends on dividing a single tectonic plate into two sections simply because of the quantity of deep ocean between the two dry elements, then we might just as well split off both Madagascar and Greenland as continents in their own right. Another problem with redefining the continents is that the African plate has also been pushed into Europe / Eurasia. In fact, what we see today as the Mediterranean Sea, dividing Europe [sic] from Africa, was just a couple of lakes if you go back 5 million years. By your definition, that makes Europe and Africa a single continent. If it isn't immediately obvious, here is southern Europe and northern Africa, solidly connected together apart from two large lakes that are today part of the (much larger) Mediterranean Sea. On this basis we should combine three of the current continents into the supercontinent "Eurafricasia" ? There are already some references to the combined landmass as "Afro-Eurasia or "Eurafrasia". Even Arnotts with their Vegemite and Cheese Aussie shaped biscuits! I have an unopened box of those that I need to sample soon. And there was an earlier comnent from a Kiwi about VB....I cannot tell you the last time I drank that swill. I'm all into Aussie and even Kiwi craft beer. Sydney's Inner West has some fantastic breweries. 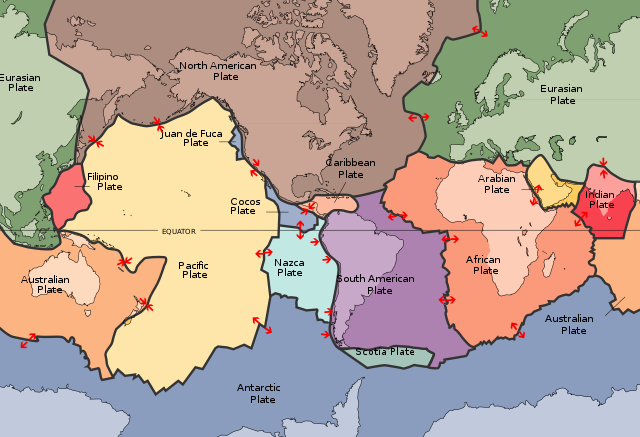 If the deciding factor is having an unique tectonic plate, than India does not belong to Asia as it has its own tectonic plate. Same goes for Arabia (Iraq, Israel, Jordan, Lebanon, Syria). That's why I included "smushed" smaller plates into bigger plates. You mean the "Far North"? It ALL depends on your point of view! Most [not all] of this thread is useless because most posters are pushing their point of view or the one they grew up with. It doesn't matter this is the WORLD WIDE WEB so everyone is entitled to their point of view, so if I want to consider North & South America one continent, I can because that's my point of view! [It also conforms to the historical definition]. If religion is the metric then you would also need to color the like of the Philippines or South Sudan? The term "Asian" is really weird. For example it include both the Chinese people and the Indian people, but generally they know each other no better than their knowledge on European. Also, Oceania is another "continent" defined in such way. It doesn't seems right to equate open and freedom to western as it should also be in other parts of the world. It's interesting that Papua New Guinea is considered as a western country while Greece is not. Slovenia and Croatia are included; the other former Yugoslavian countries are not. In truth the map is full of inconsistencies, probably because the definition of a "western nation" is vague and full of inconsistencies.